As a mom, I always make sure that my family eats fresh and nutritious food. 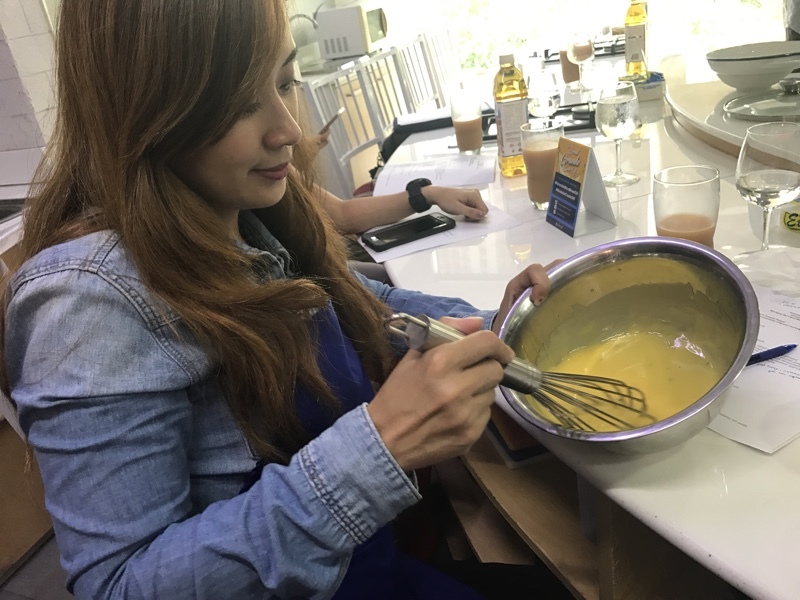 Although I don’t constantly cook at home, I’m very hands-on when it comes to choosing ingredients and other kitchen must-have whenever we go to the market or grocery. 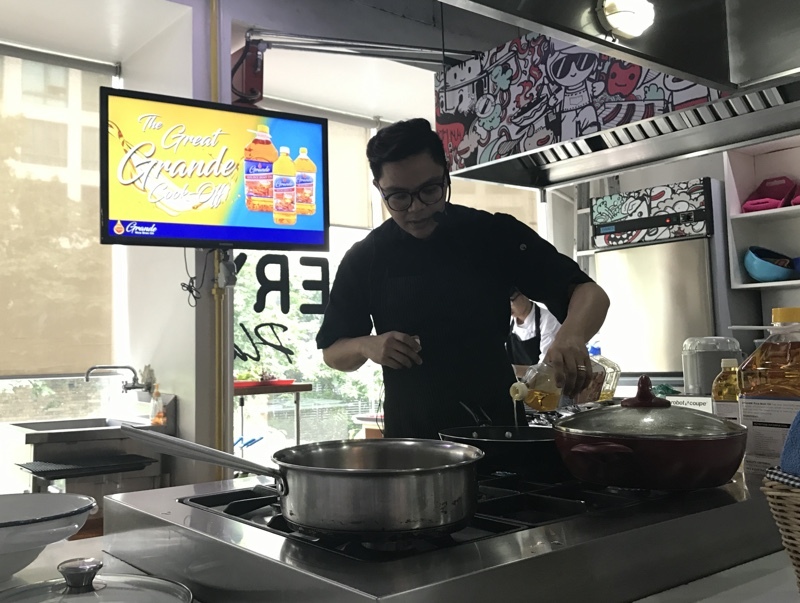 I also find ways on how to improve my own cooking skills and learn more about products and techniques that bring out the best in every meal I would prepare. 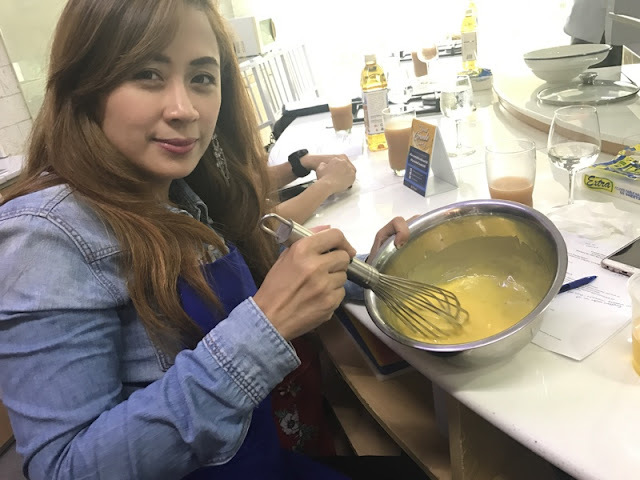 Recently, I attended and joined a cook-off session at The Cookery Place in BGC. Chef Miko Aspiras, one of the most talented and awarded chefs here in the country, made us realize and taught us a lot of helpful ideas in the kitchen. I am definitely excited to apply them when I cook at home. I’m pretty sure my boys will like it, whether it’s breakfast, lunch or dinner. Let me share my key learnings to you. During the 3-hour cooking demo, Chef Miko showed us how to prepare three delicious recipes - Sesame Tuna Aburi Tataki Salad for appetizer, Twice-fried Pork Served with Potatoes, Chorizo and Beans in Sun-dried Tomato Chimi Churi for the main course, and Pili Donuts and Cream for dessert. He's behind Le Petit Soufflé, Scout’s Honor, Freezerburn and Magnum Cafe’s sweet creations, so I made sure to really pay attention and absorb as much information as I could. By the end of the cooking class, I was really hungry and ready to eat what we have prepared. It brought us a sense of fulfillment to have produced such mouthwatering and delectable dishes from scratch. According to Chef Miko, that’s the key to achieving the optimum taste and food quality. Before this, I thought that preparing ingredients from scratch was difficult. But I was wrong! It’s very easy and simple, plus I can ensure that the food is nutritious and really tasty. 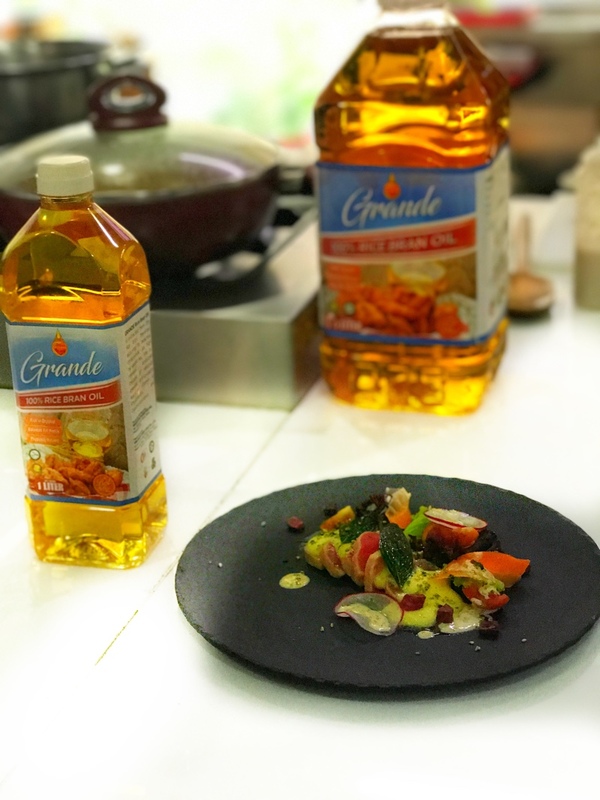 The event also happened to be the launch of Grande Rice Bran Oil, the healthy choice when it comes to the oil we use in preparing meals for our family. •	Frying can be hale and hearty. My kids love fried chicken and fish. Honestly, I don’t like it because I thought it’s not healthy, and that they should be eating something that’s delicious and nutritious at the same time. Rice Bran Oil (RBO) is the right cooking oil when it comes to frying. Using the finest process, it is produced with best quality. It is extracted from the middle layer of the husk and the grain, which make RBO rich in natural antioxidants such as Vitamin E, phystosterols, and Gamma-oryzanol. RBO is 100% physically refined so no caustics and acids are used, thus retaining all the natural nutrients within the oil. •	Just the right amount of fat. Obviously, I am health-conscious but also a food-lover. I’m glad that RBO has balanced fat profile to help me maintain my diet while enjoying what I eat. In fact, it is the closest to World Health Organization's fat intake recommended for adults, and has the most ideal fat composition. I don’t have to worry about cholesterol count because it’s trans fat free and has zero cholesterol, unlike other kinds of oil. Highly recommended for everyday use! •	Reusing oil is now an option. We avoid reusing oil at home. 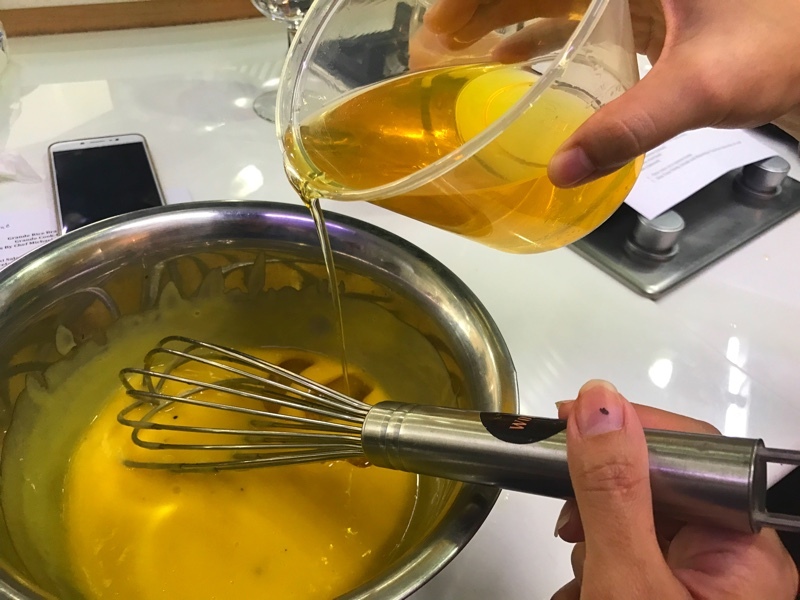 Aside from the taste of the food getting compromised, it just doesn’t feel healthy and hygienic to reuse oil, especially when the color has changed. However, I learned that the oil’s smoking point determines whether you’re supposed to reuse it or not. The smoking point is the temperature when the oil begins to burn and its nutritional value reduces. RBO has a high smoking point, so it’s really good for frying. It is more stable and can be reused. Another beneficial characteristic of RBO is its being less viscous compared to other oils, not only making your food less oily but also preserving its natural flavor. 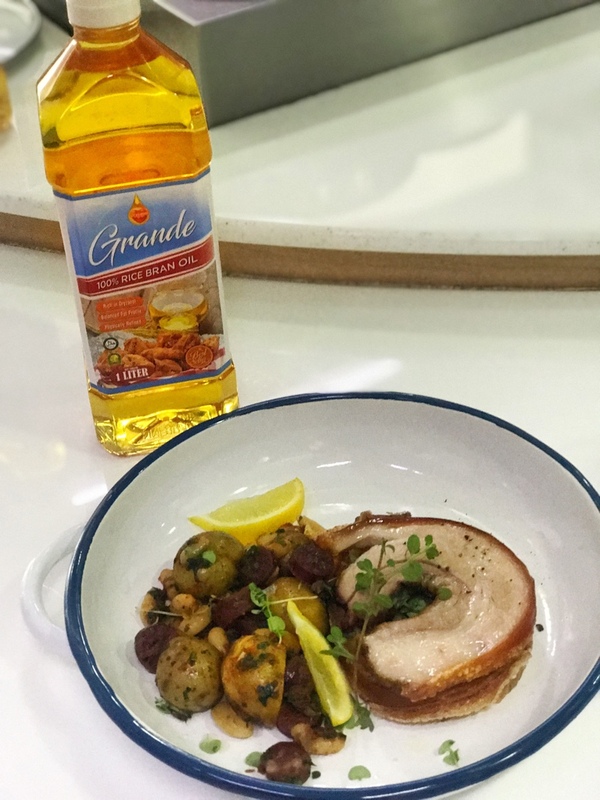 We used Grande Rice Bran Oil in our three-course meal to make it healthy and delightful. The salad was more than appetizing with mixed greens, red beets, and cherry tomatoes with thin slices of tuna that is lightly seared in Grande Rice Bran Oil, and drizzled with Sesame Mayo. Super enticing! Now, we’re talking. Let’s get to the main course. It was the best pork belly roll ever! Roasted for four hours and twice-cooked, it was a heavenly mix of flavors. According to Chef Miko, the secret to roasting with either veggies or meat is to always season with oil, salt and pepper. All set with chorizo and beans in sun-dried tomato chimi churi, it was definitely one for the books! To top it all up, we had Pili Donuts and Cream for dessert. 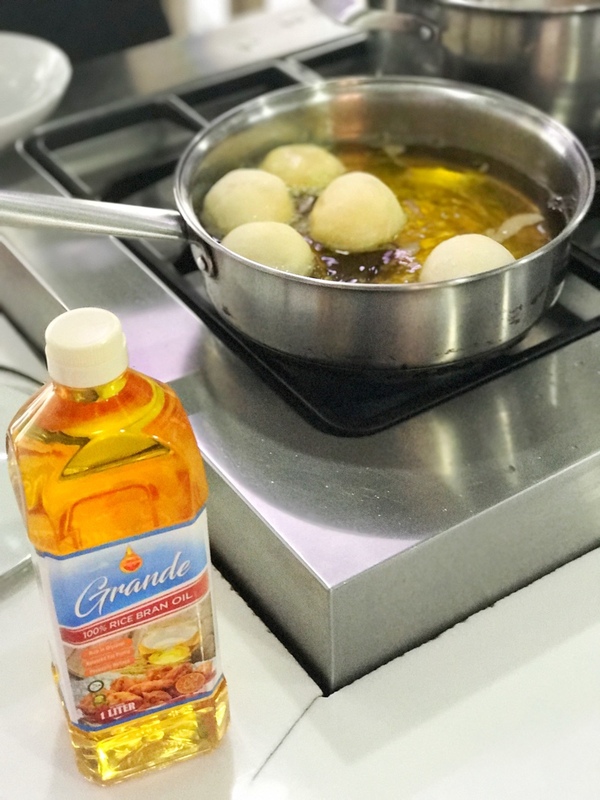 Donuts were fried in Grande Rice Bran Oil. 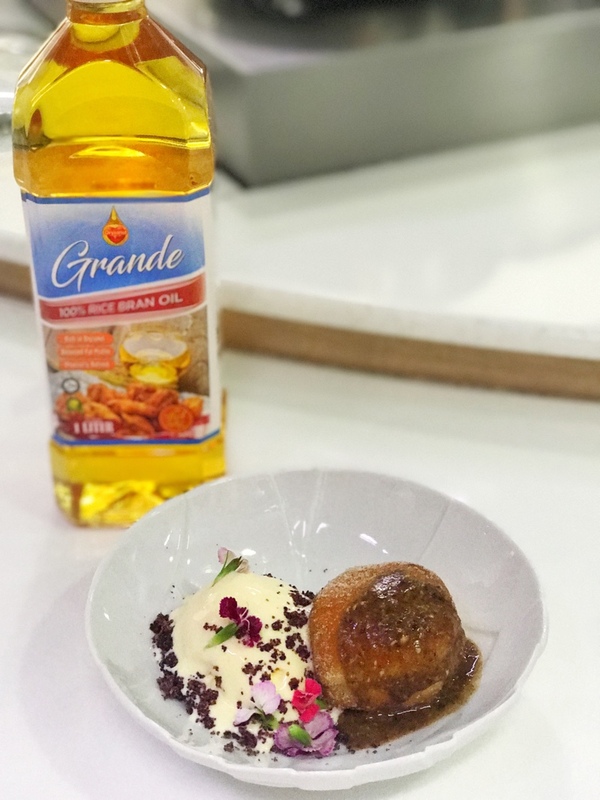 To make the pili butter glaze, Chef Miko blended the glazed pili nuts, Grande Rice Bran Oil with salt and muscovado sugar until it became smooth, then poured it onto the donuts. He sprinkled the donuts with wild raspberry powder, and finished it up with some flowers and micro greens. It was an unexpected sweet treat! I really loved it. I never thought I could use oil from appetizer to dessert. 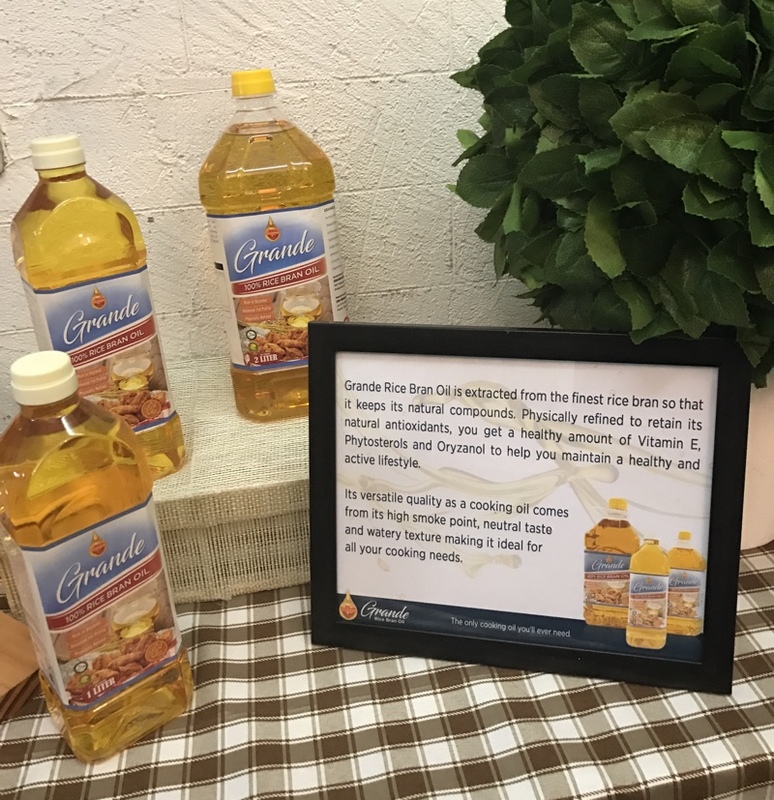 You might think it’s too much, but not when you are using a healthy oil. I’m glad that I have been part of this wonderful and undoubtedly satisfying event! Thank you so much The Grande RBO Team and #SparkItPH for inviting me. 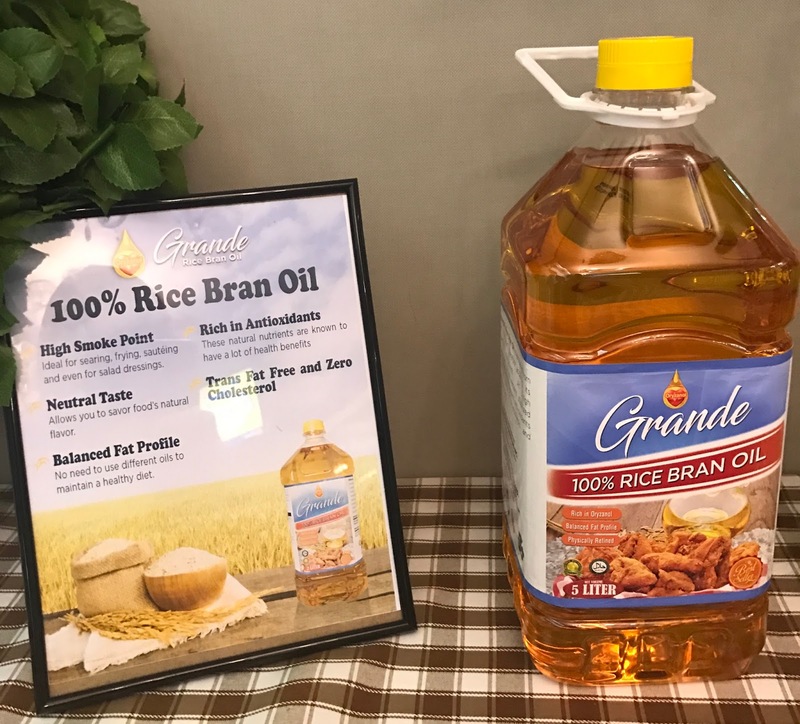 Grande Rice Bran Oil is now available in selected supermarkets and Rustan's Marketplace nationwide at Php185 per 1L bottle or Php365 for 2L. for more scrumptious and nutritious recipes that you can prepare for your family to enjoy.